KPI awards the John J. Ingalls Spirit of Freedom Award to a Kansan who uniquely supports the principles of individual liberty and economic freedom. Captain John D’Aloia, Jr. of St. Marys received the inaugural award in 2012. The award is named in honor of United States Senator John J. Ingalls (1833 – 1900). Ingalls represented Kansas in the U.S. Senate from 1873 – 1891 and served as the President pro tempore of the Senate between the 49th and 51st Congresses. One of Kansas’ founding fathers, he coined the phrase that would become Kansas’ motto “Ad astra per aspera” and helped draft the state constitution. In their history of Kansas’ political and governmental culture, Drs. H. Edward Flentje (Wichita State Univ.) and Joseph Aistrup (Kansas State Univ.) 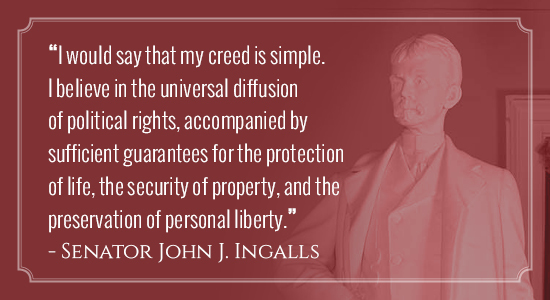 identify Ingalls as a strong believer in the principles held at both the state’s and the nation’s founding – limited government and free enterprise. In fact, the quote on the plaque presented to recipients of award is from their work. I belong to the school of politicians who think that government should interfere as little as possible in the affairs of its citizens. I have no sympathy with the paternal idea, but believe that the best results are attained when people are left to settle the great questions of society by individual effort. All that legislation can do is to give men an equal chance in the race of life. Ingalls was certainly a fierce partisan and, at one point, faced accusations of corruption. However, he was later exonerated of the charges by a Senate committee and would go on to be recognized as a leading national figure, drawing occasional presidential speculation. A native of Massachusetts and a free-stater, Ingalls migrated to Kansas in 1858 to practice law. He ultimately settled in Atchison and held many local, territorial, and state offices. 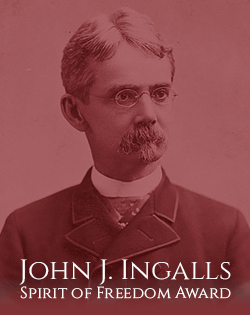 In addition to his political career, Ingalls was a publisher and author of national repute. A statue of John Ingalls also resides in the United States Capitol as part of The National Statuary Hall Collection; each state is permitted to send statues of two notable citizens to this national collection and Ingalls was joined by President and General Dwight D. Eisenhower in 2003. Senator John J. Ingalls died on August 16, 1900 in East Las Vegas, New Mexico and is buried in his adopted Atchison.